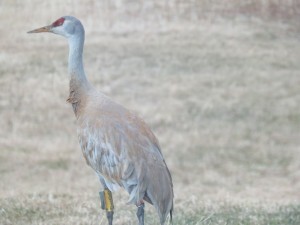 In 2008, ten Sandhill Cranes were banded in the Homer area, part of a project in collaboration with the International Crane Foundation. The satellite and radio transmitters allowed researchers to track the local movements of these cranes here in Homer, on their migration back to California’s Central Valley near Sacramento, and around their wintering areas. This information is helping biologists protect critical areas for feeding and roosting in the fast developing Central Valley. Homer’s cranes are Lesser Sandhill Cranes which need roosting and feeding areas together within 6 miles of each other. Agricultural conversions to vineyards and orchards, subdivisions, and other development threaten these important feeding areas. January 23, 2008, C016, was captured and marked at Staten Island, in the Sacramento Delta region of California. He was marked to help researcher, Gary Ivey, with his study of wintering ecology of sandhill cranes. C016 was spotted in Homer by one observer and subsequently showed up at Inspiration Ridge Preserve with three other cranes. They rested, fed, and preened until after 11 pm when they finally left for their night’s roost. Even though the batteries are now dead on these tracking device, we are still interested in the travels of these cranes. If you see banded cranes please report them to Kachemak Cranes Watch at reports@cranewatch.org or call 235-6262 to leave your report. This entry was posted in Uncategorized and tagged Banded Crane, Satellite transmitter on May 10, 2015 by Nina Faust.